Grey Tacky Traxx Mats (sometimes referred to as Grey Tacky Mats) are adhesive floor mats designed to capture dirt and other particulate from foot and cart traffic upon entrance into a controlled environment or clean area. Each mat contains 30 individually numbered sheets that easily peel off, revealing an new clean layer. 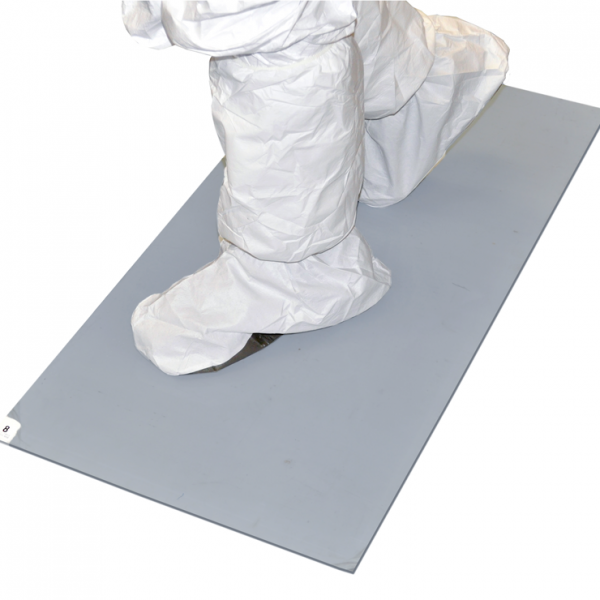 Cleanroom adhesive floor mats are a vital tool for contamination control in cleanrooms and other environments that need to eliminate dirt and dust from outside sources. In addition to the options listed on our website, we also offer custom, private label, drop shipping, and contract manufacturing services – Please Contact Us for more information. Smooth, effective surface is not easily damaged by shoes, booties, or cart wheels. 18"x36", 24"x36", 24"x45", 26"x45", 36"x36", 36"x45", 36"x60"